For Breakfast this morning I made some Simply Potatoes Shredded Hash Browns, Heated up some Meijer Diced Ham, fried an Egg Sunnyside Up, made a cup of Bigelow Decaf Green Tea. I made a bed of the Hashbrowns in a bow and sprinkled some Sargento Reduced Fat Sharp Cheddar Cheese. Next I put the Diced Ham over top the Hash Browns then put the Sunnyside Up Egg on to top it off. I needed a good hearty Breakfast to start this cold morning. The temperature this morning was at 12 degrees but we had a wind chill to take around 1 below zero! The winds are gusting around 20 miles an hour and it is cold. The day was sunny and 26 degrees but felt a whole lot colder. So I got some things done around the house then ran a few things on the computer. For Dinner tonight my Mom’s favorite, Chicken Enchiladas. I had not made these in quite a while and Mom and Dad had been wanting them so I’m preparing Chicken Enchiladas. So yesterday I went to Kroger after and picked up a Simple Life Rotisserie Chicken. Love these Roasters from Simple Truth that the Kroger Deli prepare. Always delicious and good size Roasters. I pulled all the Meat and put it in a plastic container and set it in the fridge until ready to use. To make the Enchiladas I’ll need the following; Mission Carb Friendly Flour Tortillas, 2 tablespoon Roasted Ground Cumin, 2 tablespoon Chili Powder (plus more for sprinkling), 2 tablespoons Cajun Spice, 1 teaspoon Sea Salt, 1 teaspoon freshly Ground Black Pepper, 1 Kroger Simple Truth Rotisserie Chicken (pulled meat ), Extra Light Olive Oil, 1/2 medium Red Onion (diced), Three 15-ounce cans Red Enchilada Sauce (or use Green if preferred! ), 3 cups of Sargento Reduced Fat 4 Cheese Mexican (plus more if needed), Daisy Reduced Fat Sour cream (for serving), and Chopped fresh Cilantro (for serving). I already pulled all the Meat of the Rotisserie Chicken and had it in the fridge, try not snacking on the Chicken as you’re doing this (good luck). Put the pulled Chicken in a bowl and set aside. To prepare them I preheated the oven to 350 degrees F. I’ve been using Mission Carb Friendly Tortilla for a while now. One at a time, held the Tortillas over the stove top burner (heated to medium heat) to brown slightly, about 20 seconds per side. Set the warmed Tortillas aside. In a bowl, mix together the Cumin, Chili Powder, Cajun Spice, salt and pepper. Add the pulled Chicken to the Spice Mix. Heat the oil in a skillet over medium heat add the Chicken until heated through and remove the Chicken from the skillet and set aside. In the same skillet; and add the Onions to the skillet, stir them around and cook until deep golden brown and caramelized, 4 to 5 minutes; and set them aside on a plate. Pour the Enchilada Sauce into the skillet and reduce the heat to low, allowing it to warm through. To make the enchiladas: Pour 2 cups of the Sauce (Old El Paso Enchilada Sauce) into a 9-by-13-inch Casserole Dish and leave the rest in the skillet. Dip a Tortilla into the Sauce in the skillet, then lay it on a baking sheet or plate. Sprinkle some Cheese down the middle, followed by some Chicken and finally, some of the Caramelized Onions. Roll it up tightly, then place it seam-side down in the Casserole Dish. Repeat with the rest of the Tortillas. Pour the rest of the Sauce over the Enchiladas, then sprinkle on the rest of the Cheese. Give it a final sprinkling of Chili Powder. Bake until hot and bubbly, 30 minutes. Let it sit for 15 minutes before serving. 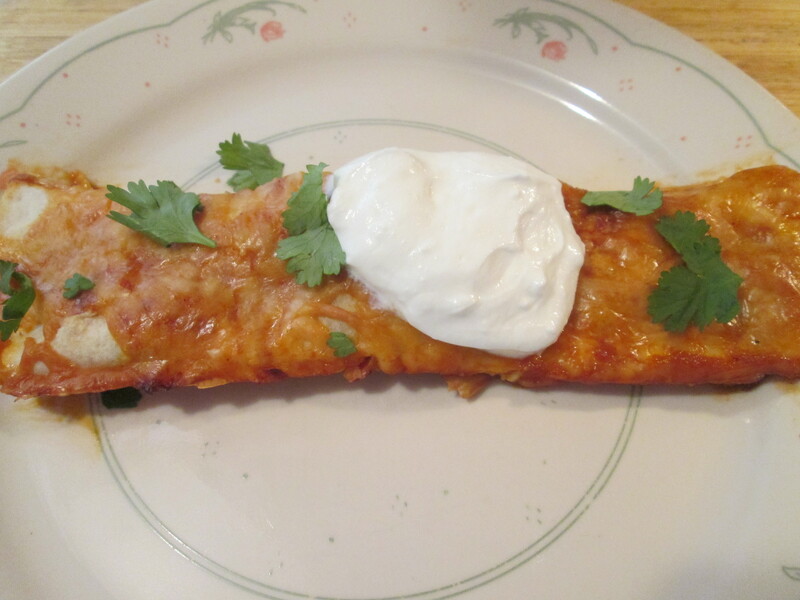 Serve the enchiladas topped with a dollop of sour cream, a sprinkling of cilantro. And time to enjoy these Enchiladas! Hot, Cheesy, and Flavorful! Another one of those Keeper Recipes courtesy of Ree Drummond of the Food Network. The original recipe is at the end of the post. For Dessert/Snack later a bowl of Skinny Pop – Pop Corn and a Diet Peach Snapple to drink. 1 – Preheat the oven to 350 degrees F.
3 – In a bowl, mix together the cumin, chili powder, Cajun spice, salt and pepper. Sprinkle both sides of the chicken breasts with the spice mix. 4 – Heat the oil in a skillet over medium heat and cook the chicken on both sides until done in the middle and the juices run clear, 4 to 5 minutes per side. Set aside on a plate to cool, then shred finely with a fork. 5 – Throw the onions into the same skillet, stir them around and cook until deep golden brown and caramelized, 4 to 5 minutes; set them aside on a plate. Pour the enchilada sauce into the skillet and reduce the heat to low, allowing it to warm through. 6 – To assemble the enchiladas: Pour 2 cups of the sauce into a 9-by-13-inch casserole dish and leave the rest in the skillet. Dip a tortilla into the sauce in the skillet, then lay it on a baking sheet or plate. Sprinkle some cheese down the middle, followed by some chicken and finally, some of the caramelized onions. Roll it up tightly, then place it seam-side down in the casserole dish. Repeat with the rest of the tortillas. Pour the rest of the sauce over the enchiladas, then sprinkle on the rest of the cheese. Give it a final sprinkling of chili powder. 7 – Bake until hot and bubbly, 30 minutes. Let it sit for 15 to 20 minutes before serving. To start the morning off I Scrambled an Egg, and fried up a couple of Jimmy Dean Turkey Sausage Links. Then I toasted a slice of Healthy Life Whole Grain Bread that I buttered with I Can’t Believe It’s Not Butter. I also made the morning cup of Bigelow Decaf Green Tea. Had some freezing rain out there this morning, the roads were a mess they say! It rained on and off all day and it was about 36 degrees. So with the freezing rain, there wasn’t a lot going on outside! Helped Mom with a couple of loads of laundry and did some house cleaning. 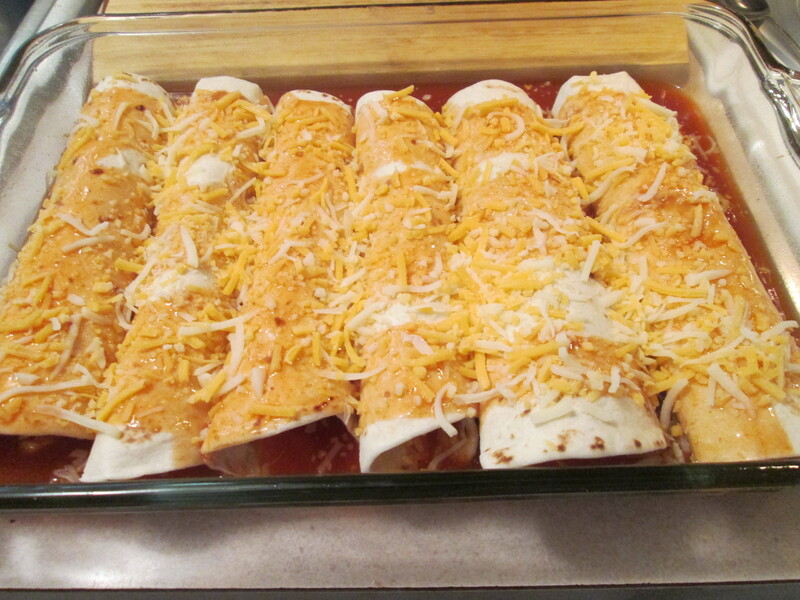 For Dinner tonight I prepared a family favorite, Chicken Enchiladas. Mom had been wanting these for a while now so I’m making them tonight for Dinner, Because, “What Mom wants I get.” So yesterday went to Kroger after Lunch and picked up a Simple Life Rotisserie Chicken. Love these Roasters from Simple Truth that the Kroger Deli prepare. Always delicious and good size Roasters. I pulled all the the Meat and put it in a plastic container and set it in the fridge until ready to use. I already pulled all the Meat of the Rotisserie Chicken and had it in the fridge, try not snacking on the Chicken as you’re doing this (good luck). Put the pulled Chicken in a bowl and set aside. To prepare them I preheated the oven to 350 degrees F. I’ve been using Mission Carb Friendly Tortilla for a while now. One at a time, held the Tortillas over the stove top burner (heated to medium heat) to brown slightly, about 20 seconds per side. Set the warmed Tortillas aside. In a bowl, mix together the Cumin, Chili Powder, Cajun Spice, salt and pepper. Add the pulled Chicken to the Spice Mix. Heat the oil in a skillet over medium heat add the Chicken until heated through and remove the Chicken from the skillet and set aside. In the same skillet; and add the Onions to the skillet, stir them around and cook until deep golden brown and caramelized, 4 to 5 minutes; and set them aside on a plate. Pour the Enchilada Sauce into the skillet and reduce the heat to low, allowing it to warm through.Bake until hot and bubbly, 30 minutes. Let it sit for 15 to 20 minutes before serving. To make the enchiladas: Pour 2 cups of the Sauce (Old El Paso Enchilada Sauce) into a 9-by-13-inch Casserole Dish and leave the rest in the skillet. Dip a Tortilla into the Sauce in the skillet, then lay it on a baking sheet or plate. Sprinkle some Cheese down the middle, followed by some Chicken and finally, some of the Caramelized Onions. Roll it up tightly, then place it seam-side down in the Casserole Dish. Repeat with the rest of the Tortillas. Pour the rest of the Sauce over the Enchiladas, then sprinkle on the rest of the Cheese. Give it a final sprinkling of Chili Powder. Bake until hot and bubbly, 30 minutes. Let it sit for 15 to 20 minutes before serving. Serve the enchiladas topped with a dollop of sour cream, a sprinkling of cilantro and a wedge of lime. And time to enjoy these Enchiladas! Hot, Cheesy, and Flavorful! Another one of those Keeper Recipes courtesy of Ree Drummond. The original recipe is at the end of the post. For dessert later a Weight Watcher’s Cookies and Cream Ice Cream Bar. 2 – One at a time, hold the tortillas over the stove top burner (heated to medium heat) to brown slightly, about 30 seconds per side. Set the warmed tortillas aside. Hungry this morning so for Breakfast I made some Simply Potatoes Shredded Hash Browns, Scrambled 2 Eggs, fried up 2 Jennie – O Turkey Breakfast Sausage Links, toasted 2 slices of Healthy Life Whole Grain Bread, and had a cup of Bigelow Decaf Green Tea. Told you I was hungry! A beautiful Autumn Day out there today, sunny and 78 degrees! Got a few things done inside and then got the cart out and did some work outside and enjoyed this gorgeous day. Took a couple spins around the neighborhood and down by the lake. 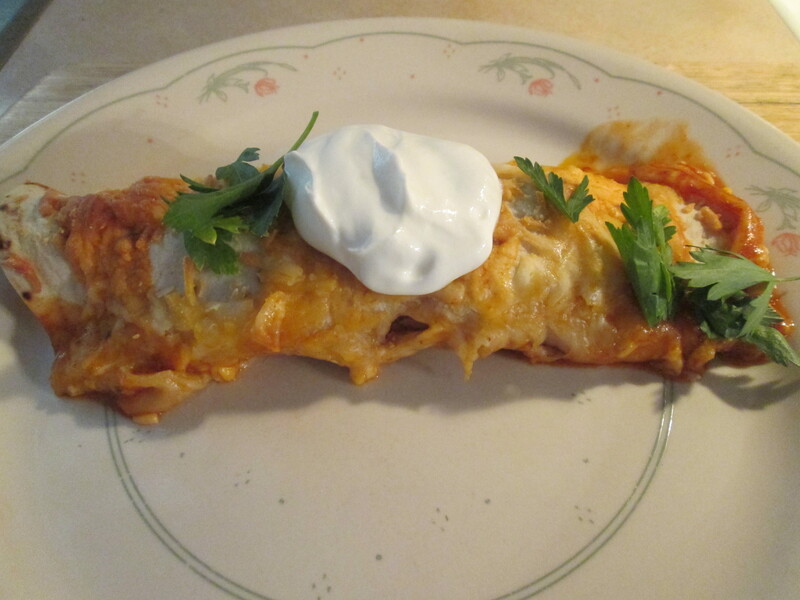 For Dinner tonight a new recipe, Chicken Enchilasagna. I just saw this recipe on the latest episode of Pioneer Woman on the Food Network and wanted to try it ASAP! What is not to like when you combine Chicken Enchiladas and Lasagna! 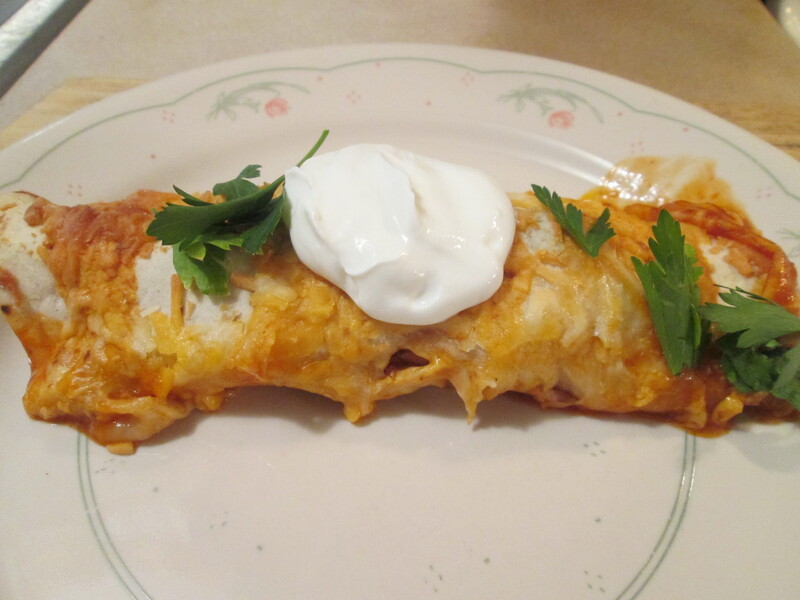 We fix the Ree Drummond Chicken Enchiladas quite often and they have become a family favorite. So pairing that with a Lasagna is perfect! To make the dish I’ll need the following; 3 tablespoons light olive oil, 1 teaspoon chili powder, 1 teaspoon ground cumin, 1 teaspoon garlic powder, 1 teaspoon Morton’s Light Salt, 1 Kroger Simple Truth Rotisserie Whole Roaster Chicken (meat pulled), 3 cups part-skim ricotta, 3 cups grated Kraft 2% Shredded Monterey Jack Cheese, 1/4 cup chopped fresh parsley, One 14-ounce can green enchilada sauce, One 14-ounce can red enchilada sauce, 1 box Ronzoni Healthy Life Whole Grain Lasagna Noodles, and 2 cups grated Sargento Reduced Fat Shredded Sharp Cheddar. You can already tell this has the makings of something good! Then to prepare the Chicken Enchilasagna; I had purchased a Kroger Simple Truth Rotisserie Whole Roaster Chicken earlier this afternoon and pulled all the meat. If you’ve never had one of the Simple Truth Roasters, they are HUGE! 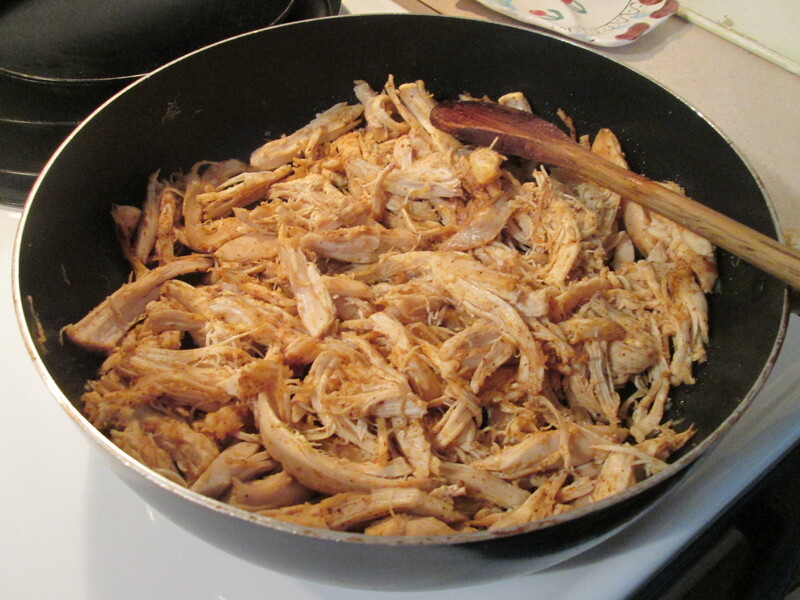 I then shredded and seasoned the Chicken Meat. Next In a large bowl, mixed together the Ricotta, Monterey Jack, Parsley and the rest of the spice mix. Then in a Lasagna Pan, pour in a little of both Enchilada Sauces. Add a layer of 4 Noodles, spoon on half the Ricotta Mixture, sprinkle on half the Chicken and pour on a little more of both Enchilada Sauces. Add another layer of 4 Noodles and repeat, ending with a layer of 3 Lasagna Noodles, the rest of the Sauce and the Cheddar on top. Baked until bubbly, about 33 minutes. The aroma alone gets your mouth watering! This turned out so incredible, as all the Pioneer Woman recipes do. Lasagna made with Chicken Enchiladas, and it combines into one delicious dish! My family loves Lasagna and now to top the Noodles with Chicken and 2 kinds of Enchilada Sauce kicks that Lasagna up about 5 flavor levels. If you are looking for something new to fix for Dinner look no further! This is a “Keeper Recipe”. So good! The original recipe and web link is at the end of the post. For Dessert later a Weight Watcher’s Cookies and Cream Ice Cream Bar. 1 – Preheat the oven to 375 degrees F.
2 – Heat a cast-iron skillet over medium-high heat and add the vegetable oil. Mix together the chili powder, cumin, garlic powder and salt in a small bowl. Sprinkle the chicken breasts with half the spice mix. Add the chicken to the skillet and cook, flipping once, until done in the middle, about 9 minutes total. Set aside to cool, then shred. 3 – In a large bowl, mix together the ricotta, Monterey Jack, parsley and the rest of the spice mix. 4 – In a lasagna pan, pour in a little of both enchilada sauces. Add a layer of 4 noodles, spoon on half the ricotta mixture, sprinkle on half the chicken and pour on a little more of both enchilada sauces. Add another layer of 4 noodles and repeat, ending with a layer of 3 lasagna noodles, the rest of the sauce and the Cheddar on top. 5 – Bake until bubbly, about 30 minutes. To start my morning off I made an Egg White Cheese Omelet. I used Egg Beater’s Egg Whites for the Omelet and used Sargento Reduced Fat Sharp Cheddar Cheese for the filling. I also toasted a slice of Healthy Life Whole Grain Bread that I buttered with I Can’t Believe It’s Not Butter. Along with the morning cup of Bigelow Decaf Green Tea. It’s the second day in a row where our heat index is above 100 degrees! It’s so humid out it makes it tough to breathe. To miserable outside to do anything so I did some house cleaning and straightened up the pantry. 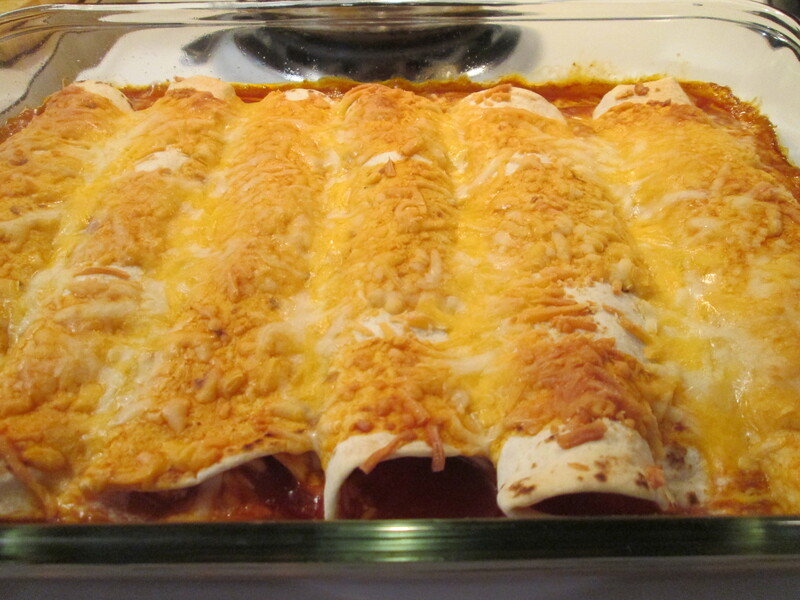 For Dinner tonight I prepared a family favorite, Chicken Enchiladas. Mom had been wanting these all week and I finally got around to making them. Because, “What Mom wants I get.” So I went to Kroger about 11:00 this morning and picked up a Simple Life Rotisserie Chicken. To make the Enchiladas I’ll need the following; Mission Carb Friendly Flour Tortillas, 2 tablespoon Roasted Ground Cumin, 2 tablespoon Chili Powder (plus more for sprinkling), 2 tablespoons Cajun Spice, 1 teaspoon Sea Salt, 1 teaspoon freshly Ground Black Pepper, 1 Kroger Rotisserie Chicken, Extra Virgin Olive Oil, 1/2 medium Red Onion (diced), Three 15-ounce cans Red Enchilada Sauce (or use Green if preferred! ), 3 cups of Sargento Reduced Fat 4 Cheese Mexican (plus more if needed), Daisy Reduced Fat Sour cream (for serving), and Chopped fresh Cilantro (for serving). I took the Rotisserie Chicken and pulled all the meat from the bones, try not snacking on the Chicken as you’re doing this (good luck). Put the pulled Chicken in a bowl and set aside. To prepare them I preheated the oven to 350 degrees F. I’ve been using Mission Carb Friendly Tortilla for a while now. One at a time, held the Tortillas over the stove top burner (heated to medium heat) to brown slightly, about 20 seconds per side. Set the warmed Tortillas aside. In a bowl, mix together the Cumin, Chili Powder, Cajun Spice, salt and pepper. Add the pulled Chicken to the Spice Mix. Heat the oil in a skillet over medium heat add the Chicken until heated through and remove the Chicken from the skillet and set aside. In the same skillet; and add the Onions to the skillet, stir them around and cook until deep golden brown and caramelized, 4 to 5 minutes; and set them aside on a plate. Pour the Enchilada Sauce into the skillet and reduce the heat to low, allowing it to warm through.Bake until hot and bubbly, 30 minutes. Let it sit for 15 to 20 minutes before serving. To make the enchiladas: Pour 2 cups of the Sauce (Old El Paso Enchilada Sauce) into a 9-by-13-inch Casserole Dish and leave the rest in the skillet. Dip a Tortilla into the Sauce in the skillet, then lay it on a baking sheet or plate. Sprinkle some Cheese down the middle, followed by some Chicken and finally, some of the Caramelized Onions, and Cheese. Roll it up tightly, then place it seam-side down in the Casserole Dish. Repeat with the rest of the Tortillas. Pour the rest of the Sauce over the Enchiladas, then sprinkle on the rest of the Cheese. Give it a final sprinkling of Chili Powder. Bake until hot and bubbly, 30 minutes. Let it sit for 15 to 20 minutes before serving. It rained yesterday, it’s raining this morning, and they say it’s going to continue to rain until in the morning! For Breakfast I had some more of the Smithfield Anytime Sliced Ham served on a toasted Healthy Life Whole Grain English Muffin. That Smithfield Ham is too good! We did have a break in the rain and I went up to the local Kroger, I need an Onion and some Enchilada Sauce for tonight’s dinner. Made it back home just as it started to pour the rain again. For dinner tonight, Chicken Enchiladas. i think this has become Mom and Dad’s favorite, Chicken Enchiladas! So they’ve been wanting some so tonight that’s what we’re having! I had come across this recipe idea in an issue of Food Network Magazine, courtesy of Ree Drummond. And it quickly became a family favorite, so thank you Ree Drummond! I took the Rotisserie Chicken and pulled all the meat from the bones, try not snacking on the Chicken as you’re doing this (good luck). Put the pulled Chicken in a bowl and set aside. To prepare them I preheated the oven to 350 degrees F. I started using Mission Carb Friendly Tortillas a while back, and loved them! One at a time, held the Tortillas over the stove top burner (heated to medium heat) to brown slightly, about 20 seconds per side. Set the warmed Tortillas aside. In a bowl, mix together the Cumin, Chili Powder, Cajun Spice, salt and pepper. Add the pulled Chicken to the Spice Mix. Heat the oil in a skillet over medium heat add the Chicken until heated through and remove the Chicken from the skillet and set aside. In the same skillet; and add the Onions to the skillet, stir them around and cook until deep golden brown and caramelized, 4 to 5 minutes; and set them aside on a plate. Pour the Enchilada Sauce into the skillet and reduce the heat to low, allowing it to warm through. Serve the enchiladas topped with a dollop of sour cream, a sprinkling of cilantro and a wedge of lime. And time to enjoy these Enchiladas! Hot, Cheesy, Flavorful, with nice Heat, not to over use the saying but it’s a “Winner, Winner Enchilada Dinner!” Another Keeper Recipe courtesy of Ree Drummond. The original recipe is at the end of the post. For dessert later a Healthy Choice Dark Fudge Swirl Greek Frozen Yogurt. Cold morning starting off. After a light Breakfast of a couple of Eggo’s Nutri-Grain Waffles I headed out to Meijer and then to Kroger. Finished up my Christmas Shopping while out also. Had a little bit of ice on the roads this morning. There was a heavy fog in some areas and the fog mist was freezing on the road, nothing too bad though. Back home finished up some house cleaning. I had bought a small Pine Christmas Tree while at Kroger and decorated it and put a small string of lights on it. Small but beautiful! 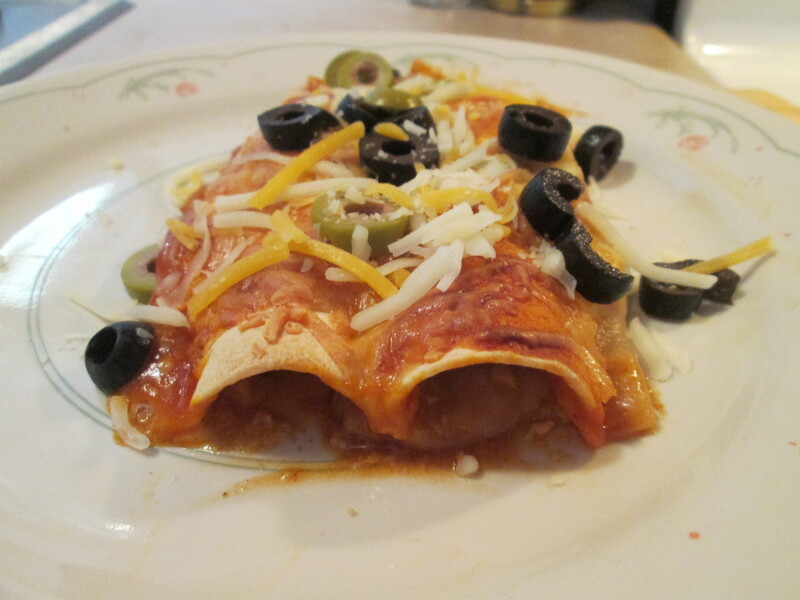 For dinner tonight everyone’s favorite, Chicken Enchiladas. 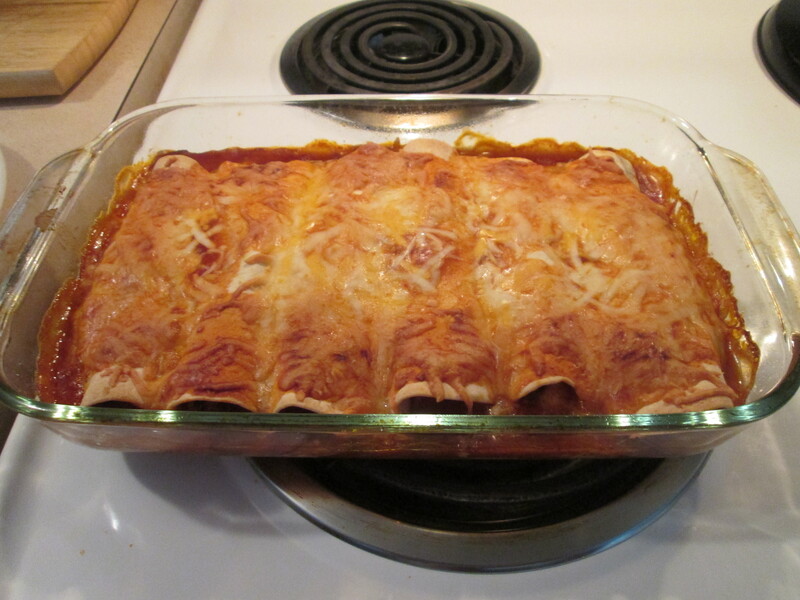 This is one of my Mom and Dad’s favorite dishes, Chicken Enchiladas, and mine also! So they’ve been wanting some so tonight that’s what we’re having! I had come across this recipe idea in an issue of Food Network Magazine, courtesy of Ree Drummond. And it quickly became a family favorite, so thank you Ree Drummond! To make the Enchiladas I’ll need the following; Mission Carb Friendly Flour Tortillas, 2 tablespoon Roasted Ground Cumin, 2 tablespoon Chili Powder (plus more for sprinkling), 2 tablespoons Cajun Spice, 1 teaspoon Sea Salt, 1 teaspoon freshly Ground Black Pepper, 1 Kroger Whole Rotisserie Chicken, Extra Virgin Olive Oil, 1/2 medium Red Onion (diced), Three 15-ounce cans Red Enchilada Sauce (or use Green if preferred! ), 3 cups of Sargento Reduced Fat 4 Cheese Mexican (plus more if needed), Daisy Reduced Fat Sour cream (for serving), and Chopped fresh Cilantro (for serving). Serve the enchiladas topped with a dollop of sour cream, a sprinkling of cilantro and a wedge of lime. And time to enjoy these Enchiladas! Hot, Cheesy, Flavorful, with nice Heat, not to over use the saying but it’s a “Winner, Winner Chicken Dinner!” Another Keeper Recipe courtesy of Ree Drummond. The original recipe is at the end of the post. For dessert later a Jello Sugar Free Dark Chocolate Pudding. One at a time, hold the tortillas over the stove top burner (heated to medium heat) to brown slightly, about 30 seconds per side. Set the warmed tortillas aside. In a bowl, mix together the cumin, chili powder, Cajun spice, salt and pepper. Sprinkle both sides of the chicken breasts with the spice mix. Heat the oil in a skillet over medium heat and cook the chicken on both sides until done in the middle and the juices run clear, 4 to 5 minutes per side. Set aside on a plate to cool, then shred finely with a fork. Throw the onions into the same skillet, stir them around and cook until deep golden brown and caramelized, 4 to 5 minutes; set them aside on a plate. Pour the enchilada sauce into the skillet and reduce the heat to low, allowing it to warm through. To assemble the enchiladas: Pour 2 cups of the sauce into a 9-by-13-inch casserole dish and leave the rest in the skillet. Dip a tortilla into the sauce in the skillet, then lay it on a baking sheet or plate. Sprinkle some cheese down the middle, followed by some chicken and finally, some of the caramelized onions. Roll it up tightly, then place it seam-side down in the casserole dish. Repeat with the rest of the tortillas. Pour the rest of the sauce over the enchiladas, then sprinkle on the rest of the cheese. Give it a final sprinkling of chili powder. Bake until hot and bubbly, 30 minutes. Let it sit for 15 to 20 minutes before serving. Rain and clouds on and off all day. we really needed the rain though. Turning a little cooler also, more like Fall Weather. Had to go to Kroger for a few items for tonight’s dinner. Then finished up some laundry for Mom. Also baked a batch of Halloween Cookies for my cousins kids that I’ll be dropping off tomorrow. After that it was the easy chair and my remote watching College Football. 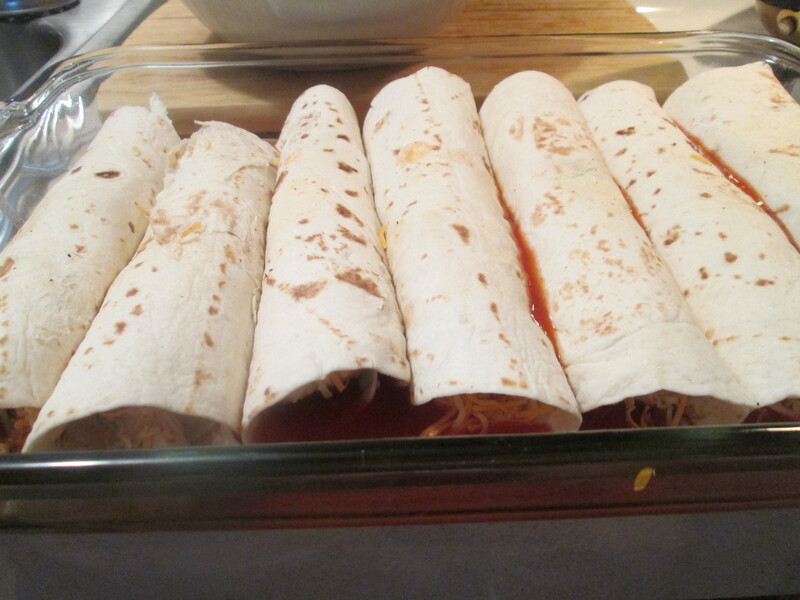 For dinner tonight I prepared Chicken Enchiladas. My Mom and Dad love these Chicken Enchiladas, as I do also. So they’ve been wanting some so tonight that’s what we’re having! I had come across this recipe idea in an issue of Food Network Magazine, courtesy of Ree Drummond. And it quickly became a family favorite, so thank you Ree Drummond! Serve the enchiladas topped with a dollop of sour cream, a sprinkling of cilantro and a wedge of lime. And time to enjoy these Enchiladas! Hot, Cheesy, Flavorful, with nice Heat, not to over use the saying but it’s a “Winner, Winner Chicken Dinner!” Another Keeper Recipe courtesy of Ree Drummond. The original recipe is at the end of the post. For dessert later a Healthy Choice Dark Fudge Swirl Greek Frozen Yogurt. Long morning, I finally got in to see the Dermatologist about the lump on my finger. No Melanoma, basically it’s type of cyst that should go away with time. Glad that is over and not Melanoma! After the doctor visit we stopped by Kroger for a few items and home. Not much going on, just relaxed. For dinner tonight Mom wanted Chicken Enchiladas. So tight I prepared Chicken Enchiladas. Then to prepare them I preheated the oven to 350 degrees F. I used Mission Carb Friendly Tortillas, first time I used them and we loved them! One at a time, held the Tortillas over the stove top burner (heated to medium heat) to brown slightly, about 20 seconds per side. Set the warmed Tortillas aside. In a bowl, mix together the Cumin, Chili Powder, Cajun Spice, salt and pepper. Sprinkled both sides of the Chicken Breasts with the Spice Mix. Heat the oil in a skillet over medium heat and cook the Chicken on both sides until done in the middle and the juices run clear, 4 to 5 minutes per side. Set aside on a plate to cool, then shred finely with a fork. Threw the Onions into the same skillet, stir them around and cook until deep golden brown and caramelized, 4 to 5 minutes; set them aside on a plate. Pour the Enchilada Sauce into the skillet and reduce the heat to low, allowing it to warm through. Serve the enchiladas topped with a dollop of sour cream, a sprinkle of diced tomatoes, a sprinkling of cilantro and a wedge of lime. Busy day today. Had a real light Breakfast and on to the morning workout. Then out the door before 7:00. First stopped at Walmart for a few items and then on to Meijer to finish up shopping. Back home put everything away, broke some of the Meat packages to freeze. Cleaned up around the house and Dad had home therapy today and a nurse stopping over later in the day. Went and got Mom’s car washed for her and back home for the day. Managed to get the cart out for a while also to enjoy a beautiful day. No humidity, sunny, and a high in the 70’s! Humidity coming back in with hotter weather tomorrow though. 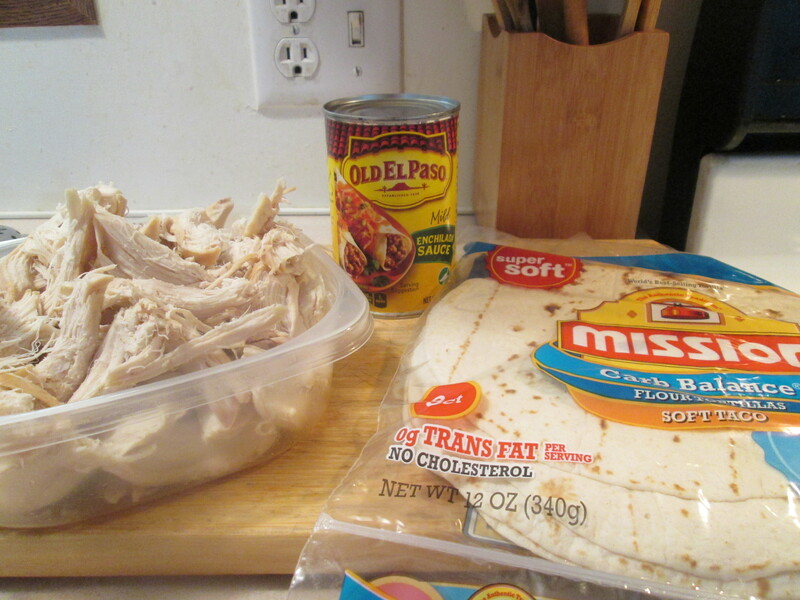 For dinner tonight I prepared a real family favorite tonight, Chicken Enchiladas. I had come across this recipe idea in an issue of Food Network Magazine, courtesy of Ree Drummond. We’ve had this twice now and it’s quickly became a family favorite! My recipe varies slightly from her original recipe, I didn’t top mine with diced Tomatoes before serving but I did top Mom and Dad’s. To make the Enchiladas I’ll need the following; 3 Mission Flour Tortillas, 2 tablespoon Roasted Ground Cumin, 2 tablespoon Chili Powder (plus more for sprinkling), 2 tablespoons Cajun Spice, 1 teaspoon Sea Salt, 1 teaspoon freshly Ground Black Pepper, 2 boneless, skinless Chicken Breasts, 1/4 cup Extra Virgin Olive Oil, 1/2 medium Red Onion (diced), Three 15-ounce cans Red Enchilada Sauce (or use Green if preferred! ), 3 cups of Kraft Shredded Cheddar-Jack Cheese (plus more if needed), Daisy Reduced Fat Sour cream (for serving), and Chopped fresh Cilantro, for serving. I used Simple Life Chicken Breasts. Then to prepare them I preheated the oven to 350 degrees F. Then one at a time, held the Tortillas over the stove top burner (heated to medium heat) to brown slightly, about 20 seconds per side. Set the warmed Tortillas aside. In a bowl, mix together the Cumin, Chili Powder, Cajun Spice, salt and pepper. Sprinkled both sides of the Chicken Breasts with the Spice Mix. Heat the oil in a skillet over medium heat and cook the Chicken on both sides until done in the middle and the juices run clear, 4 to 5 minutes per side. Set aside on a plate to cool, then shred finely with a fork. Threw the Onions into the same skillet, stir them around and cook until deep golden brown and caramelized, 4 to 5 minutes; set them aside on a plate. Pour the Enchilada Sauce into the skillet and reduce the heat to low, allowing it to warm through. To make the enchiladas: Pour 2 cups of the Sauce into a 9-by-13-inch Casserole Dish and leave the rest in the skillet. Dip a Tortilla into the Sauce in the skillet, then lay it on a baking sheet or plate. Sprinkle some Cheese down the middle, followed by some Chicken and finally, some of the Caramelized Onions. Roll it up tightly, then place it seam-side down in the Casserole Dish. Repeat with the rest of the Tortillas. Pour the rest of the Sauce over the Enchiladas, then sprinkle on the rest of the Cheese. Give it a final sprinkling of Chili Powder. Bake until hot and bubbly, 30 minutes. Let it sit for 15 to 20 minutes before serving. Serve the enchiladas topped with a dollop of sour cream, a sprinkling of cilantro and a wedge of lime. And time to enjoy these babies! Hot, Cheesy, Flavorful, with nice Heat, not to over use the saying but it’s a “Winner, Winner Chicken Dinner!” Another Keeper Recipe courtesy of Ree Drummond. The original recipe along with the web link is at the end of the post. For dessert later a Healthy Choice Dark Fudge Swirl Greek Frozen Yogurt. Cloudy and rain all day, high in the 60’s though. Good day to stay in and get some house cleaning out of the way, and a couple of loads of laundry. Glad I had that to do because there’s not much else going on. 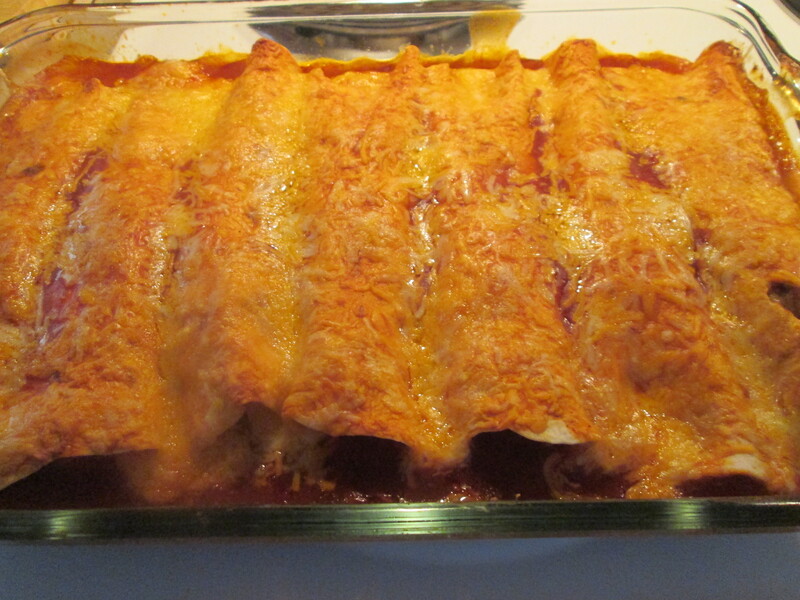 For dinner tonight a new recipe and another Enchilada, Halibut Enchiladas. I found this recipe on a Kraft Daily Recipe email I receive daily. Just another one that sounded too good not to try, Halibut Enchiladas. Why a Fish Enchiladas you ask, just for the Halibut! That was bad, sorry. Anyway to make this dish I’ll be needing; Halibut Fillets, Sargento Reduced Fat 4 Cheese Mexican Shredded Cheese, Daisy Reduced Sour Cream, Kraft Mayo w/ Olive Oil (Reduced Fat), Chopped Red Onions, Sliced Black and Green Olives, Chopped Green Chiles, Old El Paso Reduced Sodium Taco Seasoning Mix, Mission Flour Tortillas (6 inch), Old El Paso Enchilada Sauce (1-2 10 oz. Cans), and Shredded Lettuce. A big blend of goodness! To prepare them; I preheated the oven to 350ºF. 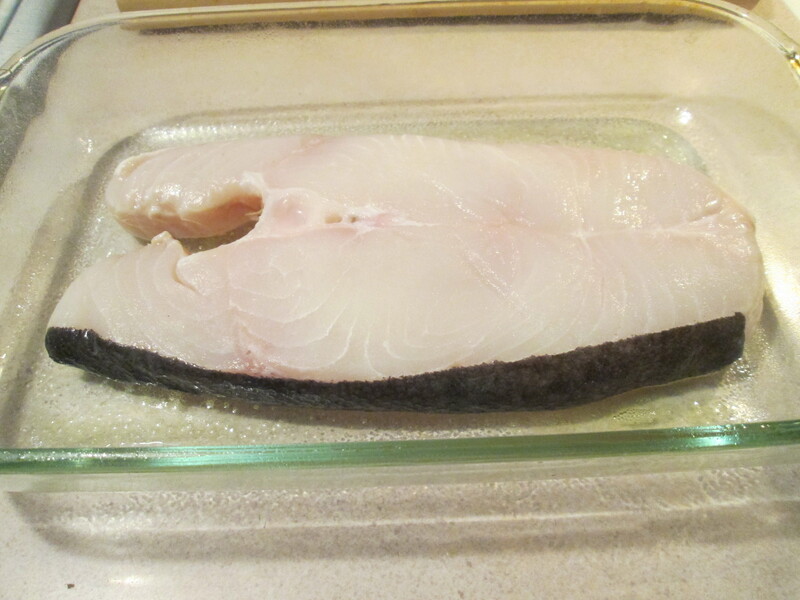 Placed the Halibut in single layer in shallow baking dish. Baked for 25 minutes, until the Fish flaked easily with a fork. Flaked the fish and placed it in a medium bowl. Stirred in 1 cup Cheese, Sour Cream, Mayo, Red Onions, Black and Green Olives, green Chilies and Taco Seasoning mix. Then spooned down the centers of Tortillas; roll up. Pour half the Enchilada Sauce onto bottom of 13×9-inch pan. Top with Enchiladas, seam-sides down. Cover with remaining Sauce and Cheese. Baked 25 to 35 min., until heated through. Top with Lettuce, Olives, and Cheese. My first Halibut Enchiladas and definitely not my last! I love Fish but I wasn’t real sure on how it would do as an Enchilada, but the Halibut works out perfect! I’ve left the original Kraft Recipe along with its link at the bottom of the post. Got me another Keeper Recipe! For dessert later a Jello Sugar Free Dark Cheery Jello. PLACE fish in single layer in shallow baking dish. Bake 25 min. or until fish flakes easily with fork. Flake fish; place in medium bowl. Stir in 1 cup cheese, sour cream, dressing, onions, 1/4 cup olives, chilies and seasoning mix. Spoon down centers of tortillas; roll up. POUR half the enchilada sauce onto bottom of 13×9-inch pan. Top with enchiladas, seam-sides down. Cover with remaining sauce and cheese. BAKE 25 to 35 min. or until heated through. Top with lettuce, tomatoes and remaining olives.